I'm having trouble finding many of the green light tests throughout level 3. Is there any reason they are no longer available or have they not been included for level 3? I used them throughout level 2 and found them very helpful. @gemma89 I take it they've removed them across the whole AAT course then. Like you said, it's a real shame as they were very helpful. Even more reason now to take full advantage of the question books that go alongside the course text books. @BradJones_FTA There was a technical issue with the website. The content should be back to normal now. 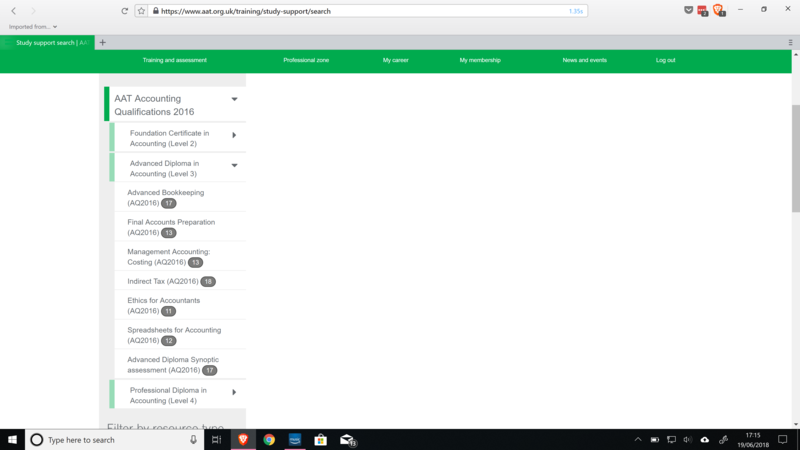 @AAT_Team It's still not showing up. It is only available for Indirect Tax and Ethics for Accountants, but nothing for the other modules. @BradJones_FTA OK, I'll pass that on. Rest assured we are aware of the issue and are working to fix it as a priority. Apologies for any inconvenience! @AAT_Team They're back up. Thank you.